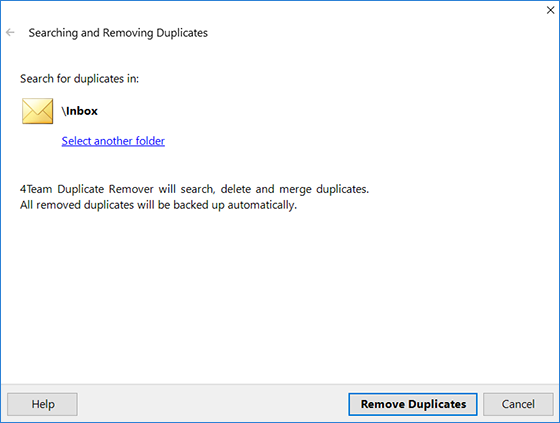 Duplicate Remover will remove duplicate emails in Outlook rapidly and efficiently. Duplicate Remover employs unique and sophisticated software algorithm. It scans all item properties, such as subject, body, from address, to address, number of attachments, importance, send and receive time, etc. Just press the Remove Duplicates button and all duplicates will be removed automatically. Outlook Duplicate Email Remover will delete duplicate emails from any folder of Microsoft Outlook. No wizards to follow, no settings to adjust. Remove duplicate emails in Outlook 2016, 2013, 2010, 2007, 2003 and 2002. For those who use Microsoft Outlook as their main email software, the idea of having duplicate items in Outlook folders is not a new one. When you have multiple Outlook duplicate emails, lots of disk space is being wasted for no reason. There is no reason to manually look through thousands of Outlook items to remove duplicate emails and contacts. Duplicate Remover will solve this problem easily. Get rid of Outlook duplicate emails. Even if hundreds of duplicates are spotted they are removed in just a few seconds. Remove duplicate emails in Outlook, it will ensure your Microsoft Outlook performs faster.